China’s ongoing military reforms hint at new confidence in the PLA’s ability to conduct informatized warfare. 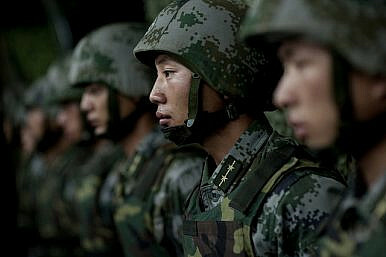 Informatization is the core of everything the People’s Liberation Army (PLA) wants to accomplish. From high-tech missions in space and cyberspace, to long-range precision strike, ballistic missile defense, and naval deployments abroad, the ability to transmit, process, and receive information is a vital enabler. Yet in the current round of reforms, which were kicked off in late 2015 and are expected to last until 2020, informatization has received surprisingly limited attention, besides the typical lip service paid by the PLA’s top leadership. The Informatization Department itself, the PLA’s highest level driver for information systems modernization, has been renamed and reduced in stature and size. These changes, which could appear to be a repudiation of the concept, actually betray the important role that informatization has played in the reforms. This organizational restructuring of informatization reflects the advancement of this critical mission, demonstrates resounding confidence in the PLA’s progress, and heralds the arrival of newer, more advanced modernization efforts. The former General Staff Department’s Informatization Department (信息化部) was responsible for an extremely expansive mission. Established in the early 1990s as the Communications Department and then renamed in 2011, the Informatization Department’s mission and functions have evolved along with the concept of informatization, thus growing in scope over time. Although the notion of “informatization” itself is infamously amorphous, this concept alludes to the comprehensive integration of information technology into the PLA and the improvement of its ability to utilize information. The breadth of the Informatization Department’s purview reached its peak prior to the reforms, which saw the department renamed and downsized, with a number of its units shifted to support other organizations. Although the reforms will continue through 2020 – and details on force disposition are still forthcoming – the informatization corps appears to have been split along functional lines. The Informatization Department’s own successor organization, the Joint Staff Department’s Information and Communications Bureau, takes responsibility for high-level command and control; the Strategic Support Force appears to incorporate information support capabilities; and the CMC’s Equipment Development Department has inherited the research institutes and laboratories formerly under the department. First and foremost, the Information and Communications Bureau (信息通信局) is responsible for support to national-level command and control, arguably the Informatization Department’s most important mission. Dong Xiaobo, deputy director of the former Informatization Department and now of the Information and Communications Bureau, has highlighted that the original department had a broader mandate for the force-wide “informatization construction” process, but the Information and Communications Bureau now focuses on strategic command and communications assurance, with an eye to preparing for war-fighting contingencies. This aligns with the overriding objective of the reforms, to restructure the PLA to maximize its combat capabilities. The Information and Communications Bureau directly supports the CMC Joint Operations Command Center (军委联合作战指挥中心) and could also coordinate with service-level Information and Communications Bureaus, in support of theater command joint operations command. The operational aspects of the Informatization Department’s mission have traditionally been invested in the Information Assurance Base (信息保障基地), which has remained under the Information and Communications Bureau. Broadly speaking, the Information Assurance Base has been responsible for information assurance – ensuring the availability, integrity, and management of information and communication systems – and strategic information support – the management of intelligence, surveillance, and reconnaissance information systems in support of strategic objectives. The Information Assurance Base has also played a critical role in the management of the PLA’s integrated command platform. As the PLA’s highest-echelon informatization unit before the reforms, the Information Assurance Base’s purview was broad and, like that of the Information and Communications Bureau, has likely been scaled down in the reforms. Given the scarcity of data, it remains difficult to determine which functions and missions the Information Assurance Base has retained and which have moved to other organizations within the PLA. One such mission, that of strategic information support, has been transferred, as a whole or in part, to the newly-established Strategic Support Force. The Strategic Support Force has been created from operational units formerly under the PLA’s General Departments that were responsible for space, cyber, electronic, and psychological warfare. Initially, there were expectations that the Strategic Support Force would take over the PLA’s informatization mission in its entirety, but this does not appear to be the case. Instead, only the Informatization Department’s Satellite Main Station seems to have moved to the Strategic Support Force, under its Aerospace Systems Department (航天系统部). This does not preclude the potential that other informatization units might have been transferred as well, but there is not adequate evidence available at this point. Given the Strategic Support Force’s mission – and the “slimming down” of the Information and Communications Bureau and the Information Assurance Base – it stands to reason that certain specialized units, such as those responsible for spectrum management or computer network defense, could also have been transferred in order to integrate and support war-fighting in the cyber and electromagnetic domains. Concurrently, certain research, development, and testing aspects of the former Informatization Department appear to have been taken on by the new CMC Equipment Development Department (装备发展部), the successor to the General Armaments Department’s (总装备部) equipment development and acquisition mission. Notably, the 61st Research Institute and the 63rd Research Institute, which formerly supported the Informatization Department, both appear to have been transferred to the Equipment Development Department, perhaps under its Information Systems Bureau (信息系统局). The 61st Research Institute previously supported the Informatization Department’s Science and Technology Equipment Bureau (科技装备局), which was involved in the development of operational and technical requirements. As such, its transfer may indicate the shift of that bureau as a whole to the Equipment Development Department. The 63rd Research Institute has traditionally focused on electromagnetic spectrum technology and anti-jamming research. Of course, these movements don’t account for all of the former Informatization Department’s various subordinate, officers, bureaus, departments, and units. The department was incredibly massive, with a nation-wide network of communications stations and signal regiments. Given its scale, the extent of its restructuring may remain unclear for the foreseeable future. It is possible that a number of communications stations and signal regiments have been transferred to the newly-established Army leading organ, the headquarters of the PLA Ground Forces, to support its operations. As a completely new entity, the leading organ will likely be in want of communications infrastructure and support that the Informatization Department was in a unique position to provide. In conclusion, the move from a singular entity like the Informatization Department to a more distributed, force-wide program implies that the CMC is confident enough in the PLA’s institutions to move beyond consolidated control, instead starting to establish more normative processes and organizations. One telling indicator is that the Central Military Commission proceeded with the reforms in the first place. The predominant objective of the reforms, a more joint, integrated force, demands as a prerequisite that the PLA has achieved a basic level of informatization, with integrated communications, intelligence, and systems acting as a “substrate” for joint operations. It’s unlikely that military leaders would have gone forward with these changes unless there was already a solid technological foundation to ensure their success. The fact that the PLA had required such a singular champion for this process is telling. Despite its rapid progress, modernization has been a painful and protracted process for the PLA. The enormous power that the Informatization Department wielded enabled it to serve as a driving force for major infrastructure projects, allowing the consolidation and integration of systems over time. Its reconfiguration may indicate that the major, large-scale work of informatization has been completed and key missions can now be operationally shifted to other organizations, with planners taking up the mantle for higher-level force-wide programs. Perhaps most importantly, the changes reflect an inflection point in the PLA’s modernization agenda, presaging a new phase of informatization. Major General Wang Kebin, director of the former Informatization Department, has stated China’s “information revolution” has progressed in three stages: “digitalization,” networkization,” and finally, the current stage, “intelligentization.” This third stage of informatization, the culmination of decades of concentrated effort by the PLA, will involve the utilization of emerging technologies, including artificial intelligence, big data, and cloud computing, to enhance the PLA’s C4ISR capabilities. Thus, this initial evidence that the PLA has restructured its organizational approach to informatization could signify a significant evolution of this strategy. Elsa Kania is an analyst at the Long Term Strategy Group. She is a graduate of Harvard College and is proficient in Mandarin Chinese. Elsa recently testified before the U.S.-China Economic and Security Review Commission (USCC) on the PLA’s unmanned systems and military applications of artificial intelligence. John Costello is a Senior Analyst for Cyber and East Asia at Flashpoint. He is a Cybersecurity Fellow for New America. John is also a U.S. Navy veteran, former NSA Analyst, and proud alum of Defense Group Inc. He is fluent in Mandarin Chinese. Beyond cyber and space warfare, the SSF will play a key role in conventional joint operations.